Catholic Community Services of Lane County has begun its annual Winter Clothing Drive, which runs through Feb. 17. Donations of winter coats, socks, mittens, hats, blankets, linens and shoes will be distributed free by the agency to homeless and low-income families at centers in Eugene and Springfield. Collection boxes have been set up at more than 30 different churches and organizations, including Marist High School; O'Hara School; St. Paul, St. Jude, St. Mark, St. Mary, St. Peter and St. Thomas More churches in Eugene; St. Alice Church in Springfield; St. Helen in Junction City; and St. Rose of Lima in Monroe. Any business or organization can participate by setting out a collection box. The drive also accepts cash donations, which will be used to purchase winter clothing for free distribution to those in need of aid. 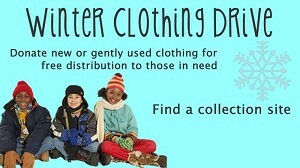 Donations can be made at ccslc.org.